Reaffirming the April 27. 2018 Panmunjom Declaretion, the DPRK commits work toward complete denuclearization of the Korean Peninsula. The United States and the DPRK commit to recovering POW/MIA remains, including the immediate repatriation of those already indentified. 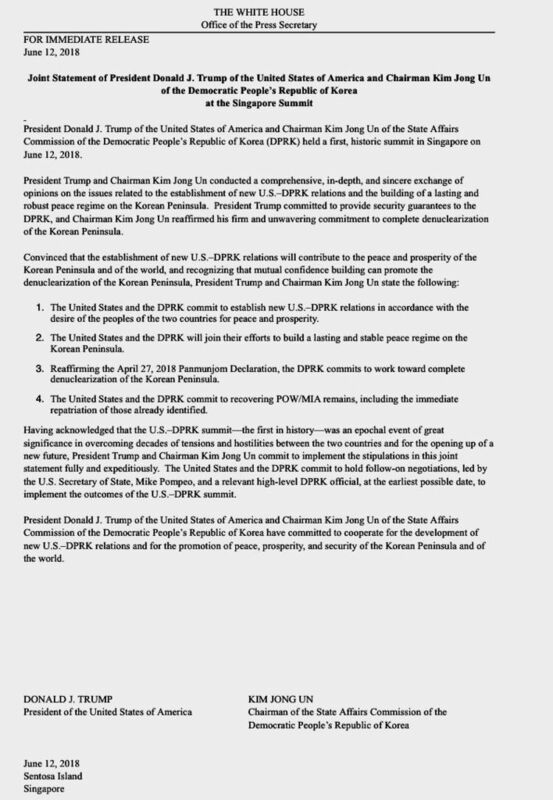 and for the opening up new future,President Trump and Chairman Kim Jong Un commit to implement the stipulations in this joint statement fully and expeditiously. The United States and the DPRK commit to hold follwow-on negotiations, led the U.S. Secretary of State, Mike Pompeo, and a relevant high-level DPRK official, at the earliest possible date implement the outcomes of the U.S.-DPRK summit. Well thank you very much everybody we appreciate it we're getting ready to go back had a tremendous 24 hours we've had a tremendous three months actually because this has been going on for quite a while that was a tape we gave to chairman Kim and his people his representatives and it captures a lot captures what could be done that's a great a great place has a potential to be an incredible place between South Korea if you think about it and China that's a tremendous potential and and I think he understands that and hi wants to do what's right. Ii's my honoer today to address the people of the world following this very historic summit with chairman Kim Jongwan of North Korea spent very intensive hours together. And I think most of you have gotten the signed document or you will very shortly. I also want to thank president Moon of South Korea he's working hard in fact I'll be speaking to him right after we're finished. I want to thank them for their efforts to help us get to this very historic day. Most importantly I want to thank chairman Kim for taking the first bold step toward a bright new future for his people our unprecedented meeting the first between an American president and a leader of North Korea proves that real change is indeed possible. My meeting with chairman Kim was honest direct and productive we got to know each other well in a very confined period of time under very strong strong circumstance. We're prepared to start a new history and were ready to write a new chapter between our nations. Nearly 70 years ago think of that 70 years ago an extremely bloody conflict ravaged the Korean Peninsula countless people died in the conflict including tens of thousands of brave Americans. Yet while the armistice was agreed to the war never ended to this day never ended but now we can all have hope that it will soon end and it will it will soon end the past does not have to difine the future. Yesterday's conflict does not have to be tomorrow's war and as history has proven over and over again. Adversaries can indeed become friends. We can honor the sacrifice ot our forefathers by replacing the horrors of battle with the blessings of peace, and that's what we're doing and that's what we have done. There is no limit to what North Korea can achieve when it gives up its its nuclear weapons and embraces commerce and engagement with the rest of the world that really wants to engage chairman Kim has before him an opportunity like no other to be remembered as the leader who usherd in a glorious new era of security and prosperity for his people. 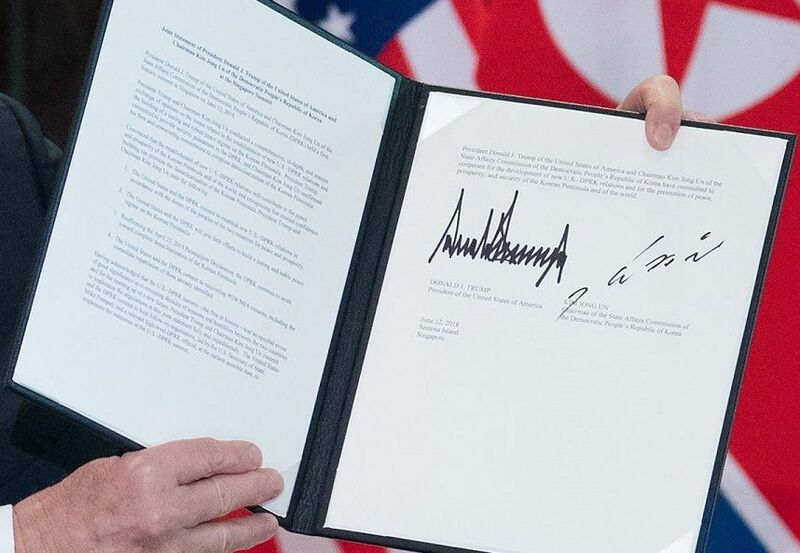 Chairman Kim and I just signed a joint statement in which he reaffirmed his unwavering commitment to complete denuclearization of the Korean Peninsula. We also agreed to vigorous negotiations to implement the agreement as soon as possible and he wants to do that. This isn't the past this isn't another administration that never got it started and therefore never got it done. Chairman Kim has told me that North Korea is already destroying a major missile engine testing site that's not in your signed document. We agreed to that after the agreement was signed. That's a big thing for the missiles that they were testing the site is going to be destroyed very soon. Today is the beginning of an arduous process our eyes are wide open but peace is always worth the effort especially in this case they should have been done years ago, they should have been resolved a long time ago, but we're resolving it now. Chairman Kim has the chance to seze an incredible future for his people anyone can make war but only the most courageous can make peace the current stateof affairs cannot endure forever the people of Korea north and south are profoundly talented industrious and gifted these are truly gifted people. They share the same heritage language customs culture and destiny but to realize their amazing destiny to reunite their national family the Menace of nuclear weapons will now be removed in the meantime the sanctions will remain in effect. it's going to be there it's going to happen people thought this could never take place it is now taking place. It's a very great day it's a very great moment in the history of the world.And chairman Kim he's on his way back to North Korea and I know for a fact as soon as he arrives he's going to start a process that's gonna make a lot of people very happy and very safe so it's an honore to be with everybody today the media is a big gathereing of media I will say makes me feel very uncomfortable (笑い声) but it what it is people undrestand that this is something very important to all of us including yourselves and your family so thank you very much for being here. What part did Japan play and did the abduction you should come up. also the fate of the Christians and this question is when will you be doing an interview with Japanese TV fifty thousand American troops are in Japan. Fifty thousand great troops that's true yeah it did abduction absolutely as Prime Minister Abe's one of his certainly other than the whole the nuking subject certainly his I would say his main point and I brought it up absolutely and they're gonna be working on that it will be. We didn't put it down in the document. But it will be worked on. Christians yes we are brought it up very strongly you know Franklin Graham spent spent and spends a tremendous amaount of time in North Korea. He's got it very close to his heart it did come up and things still be happening. Thank you for praying. It seems the #SingaporeSummit went very well. This is just the beginning of a new chapter between NK & the U.S. My continued prayer is that God will give wisdom to both leaders. I’m thankful we have a @POTUS who was willing to take the risk.